Blue poppy Meconopsis grandis, copyright Kenpei. 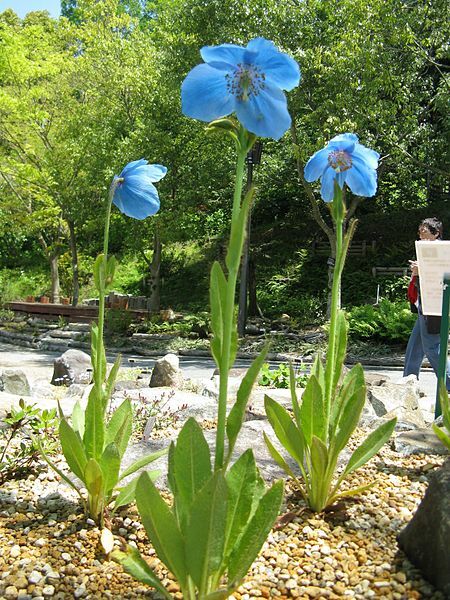 Meconopsis is a genus of large-flowered herbs found primarily in the Sino-Himalayan region. Characters (from Flora of China): Herbs, monocarpic or perennial, yellow lactiferous. Taproot distinct in monocarpic species, plump, extended or napiform thickened, accompanied by fibrous roots, or fibrous. Stems, when present, branched or not, bristly, setose, pubescent, or glabrous. Leaves cauline and basal or all basal and forming a rosette; rosette leaves persistent in winter or dying away to a resting bud or buds; blade entire, serrate, or pinnatifid to pinnate, glabrous to bristly; basal leaves and lower cauline leaves usually petiolate; upper cauline leaves shortly petiolate or sessile, sometimes amplexicaul. Inflorescence a raceme, panicle, or pseudoumbel, with uppermost flower opening first, or flowers solitary, then often on basal scapes. Flowers large, often bowl- or saucer-shaped. Sepals 2, very rarely 3 or 4 in terminal flowers, caducous. Petals 4-10, occasionally more, blue, purple, pink, red, or yellow, rarely white. Stamens numerous; filaments mostly linear, rarely dilated in lower part. Ovary nearly spherical, ovoid, or obovoid to narrowly terete, 1-loculed, with 3 or more carpels, containing numerous ovules; styles distinct, usually short, sometimes almost absent, regularly stout or basally expanding into a disk covering top of ovary; stigmas free or united, capitate or clavate. Capsule nearly spherical, ovoid, obovoid, or elliptic to cylindrical, spiny, setose, pubescent, or glabrous, 3-12(-18)-valvate; segments slightly lobed or divided to 1/3 length or more from apex to base. Seeds many, ovoid, reniform, falcate-oblong, or oblong, smooth or longitudinally concave, without a caruncle.